Your ad to people who love pets! With Ads by PetAdvantage, you set your own budget to reach people you want. 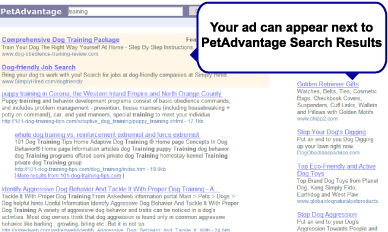 Be seen on search results, or on our network of pet related content sites. The best part, you only pay when someone clicks on your ad! Own a pet related web site? Become a partner! Highly targeted viewers - people are already people who have or love pets! Be seen on pet related sites, search engines, and blogs. Only pay for people that visit your site. Create your first ad in just a few minutes.